In our previous study, we have shown that PARP-1 inhibition (genetic or pharmacological) ameliorates elastase-induced inflammation and emphysema. Since matrix metalloproteinases (MMPs) particularly MMP-2 and MMP-9 are known to play a critical role in emphysema development, the present work was designed to evaluate the effects of PARP-1 inhibition on their expression utilizing elastase-induced mouse model of emphysema. Our data show that olaparib administration at a dose of 5 mg/kg b.wt. (daily) significantly prevented the elastase-induced inflammation as indicated by decreased inflammatory cells particularly macrophages in BALF at 1 week post-injury. In addition, the drug restored the altered redox balance in the lungs of elastase-treated mice toward normal. 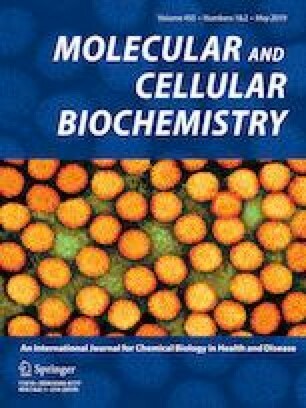 Further, PCR data show that olaparib administration ameliorates the elastase-induced expression of MMP-2 and MMP-9 without having much effect on the expressions of their inhibitors TIMP-1 and TIMP-2. Next, our data on immunoblot, gelatin zymography, and immunohistochemical analysis indeed confirm that olaparib reduced the elastase-induced expression of MMP-2 and MMP-9. Reduction in the expression of metalloproteinases correlate well with the PARP activity as olaparib treatment suppressed the elastase-induced expression of PAR modified proteins markedly. Overall, our data strongly suggest that PARP-1 inhibition blunts elastase-induced MMP-2 and MMP-9 expression, which may be partly responsible for prevention of emphysema. The online version of this article ( https://doi.org/10.1007/s11010-019-03510-1) contains supplementary material, which is available to authorized users. The financial assistance provided by the Department of Biotechnology, Government of India (BT/RLF/Re-entry/36/2012) (BT/PR/7968/MED/122/33/2016), DST-PURSE, and UGC-SAP to Dr. Amarjit Singh Naura is acknowledged. We also acknowledge the Senior Research Fellowships to Vivek Dharwal from CSIR.